If your tooth has been damaged or you have a large filling, a dental crown may be the ideal solution. Available at Hart Dental, a crown holds your tooth together, allowing you to regain its full function. Once your need for a crown has been identified, we will take a series of digital X-rays for a more comprehensive look at your situation. Intraoral images will also assist in understanding how best to proceed. Sometimes a filling may hold the tooth together but if after a closer look the decay is greater than anticipated, a crown may be best. Be rest assured that we will give you our honest assessment and we welcome your questions regarding a service. To begin, the old filling or decay will be removed, leaving only the tooth structure that is still supported. Local anesthetics will be given but you can also choose to have nitrous oxide administered to ensure your comfort. The crown is created from impressions we’ll send to a local laboratory. After about two weeks, your custom-made crown is sent back to our clinic. As part of our on-going attention to detail, we will make sure you are happy with the shade of your new crown. Meanwhile, you’ll be given a temporary crown so that you have the full function and look of a natural smile. 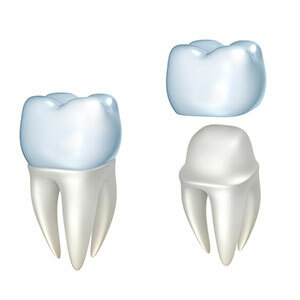 Dental crowns are available in a variety of materials. We usually recommend aesthetically pleasing materials like zirconia or porcelain. In some cases, such as for a back tooth, gold or other metals can also be used, either as an all metal crown or porcelain fused to metal crown. Many insurance plans will cover dental crowns, making it an affordable way to improve your oral health. Contact us today to schedule an appointment! If you’re experiencing a dental emergency, we’re here for you 24 hours a day, seven days a week.